This is Geisha when she was about 4 years old. 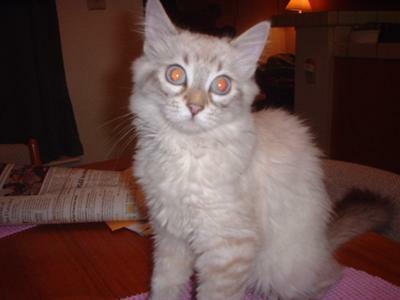 About 6 months or so ago, my nine year old DLH (Lynx Point Siamese) cat suddenly was unable to meow anymore. Now, she makes this awful, very abrubt, screech-like sound that ends with this really weird choke sound. It is very disturbing when she does this. It doesn't seem to bother her that much, but it scares me to death every single time. About a year ago, she developed an allergy to a specific kind of canned cat food and I was wondering if her food allergy could have caused some sort of permanent damage to her vocal cords. Her allergy symptoms were primarily diarrhea and she would break out in little itchy sores/scabs all over her skin (mostly on her neck, back,and tail). When her allergy symptoms disappeared and she returned to normal, the weird "meow" or sound did not go away. She never lost her ability to purr, but now I am wondering if she will ever get her sweet little voice back. Any clues as to what might be going on with her? PS - her name is Geisha. Have you taken her to see the vet in the last 6 months? If not then i think it may be a good idea to have her throat checked out, From the sound of it there may be something stuck there. I think it is worth having this checked out first. Hopefully it is nothing just a quirk of your cat but i think it would be worth having it checked.